This Podium Pro Audio speaker is designed with pride right here in the USA. Customized built-in passive crossover perfectly mates the 20oz loudspeaker and high-frequency wide dispersion horn driver without losing essential midrange reproduction. The port's design smoothes air flowing in and out of the cabinet, reducing turbulence and port noise. The port also increases linearity, lowers distortion, reduces 5th order harmonic distortion and provides an output increase as high as 2-3dB. Acoustic dampening material is applied within the enclosure to reduce standing waves. No cheap materials used, this heavy duty speaker is constructed tough with top-grade 3/4" MDF wood to exceed your highest expectations! Only deluxe impact-forgiving aviation black carpet is used and tough ABS plastic corners help to prevent premature wear. Terminal consist of two 1/4" jacks and spring loaded quick raw wire connectors. Speaker mount for pole speaker stand. 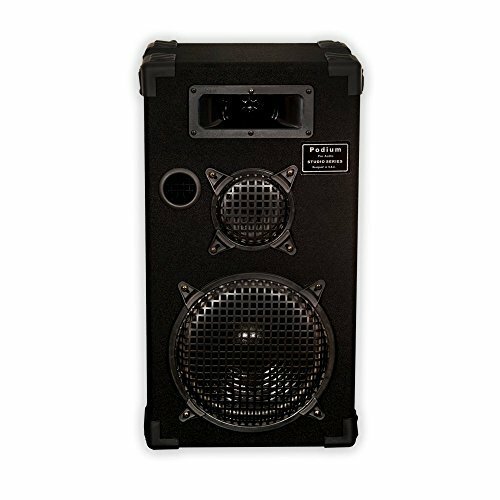 This multi-purpose Pro Audio Speaker was designed for many uses including Studio Monitor, PA, DJ and even Musical Instruments!! This speaker is built tough and built to last.